146 Marlborough is located on the south side of Marlborough, between Clarendon and Dartmouth, with 144 Marlborough to the east and 148 Marlborough to the west. 146 Marlborough was built in 1872-1873 by John Fisher Farrington, a carpenter and builder, for speculative sale, one of five contiguous houses (140-142-144-146-148 Marlborough). He had built three contiguous houses in 1871-1872 at 132-134-136 Marlborough. 138 Marlborough was a vacant lot until 1891. 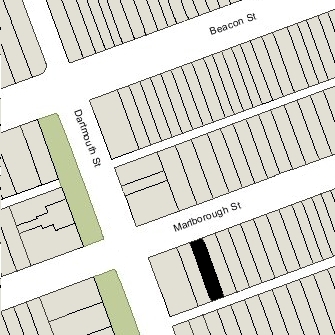 The five houses at 140-148 Marlborough were built on a 121 foot wide parcel that John Farrington acquired in three transactions: a 58 foot wide lot to the east on July 29, 1872, from Francis E. Parker; a 25 foot lot to the west on November 2, 1872, from Louisa (Bronson) Hunnewell, the wife of Hollis Hunnewell; and a 38 foot wide lot between the other two on April 15, 1873, from Joseph Washington Clark. The land had been held by several owners. It originally was part of six lots purchased from the Commonwealth of Massachusetts: a 24 foot lot to the east purchased on April 11, 1864, by Robert R. Bishop, three 24 foot lots in the middle purchased on April 17, 1864, by George Putnam, Jr., and two 24 foot lots to the west purchased on March 30, 1865, and April 6, 1865, by Peleg Whitman Chandler. On April 8, 1865, Peleg Chandler purchased a third lot, with a 30 foot frontage running to the corner of Marlborough and Dartmouth, and on April 3, 1869, he sold all three of his lots to Louisa Hunnewell. Hollis and Louisa Hunnewell built their home at 315 Dartmouth on the western 53 feet and sold the remaining 25 feet to John Farrington. Click here for an index to the deeds for 146 Marlborough. On November 1, 1873, 146 Marlborough was purchased from John Farrington by Mary Eliza (Sweetser) Guild, the wife of Chester Guild. They previously had lived at 2 Derne. Chester Guild was treasurer of the Hide and Leather Machine Company. The Guilds continued to live at 146 Marlborough during the 1875-1876 winter season, but moved thereafter to the Evans House hotel. Mary Guild continued to own 146 Marlborough and lease it to others. By the 1876-1877 winter season, 146 Marlborough was the home of wholesale leather dealer George Franklin Putnam and his wife, Sarah Becket (Hood) Putnam. They lived there briefly until the new home they were having built at 273 Beacon was completed in October of 1877. During the 1877-1878 winter season, 146 Marlborough was the home of wholesale coal dealer Charles Paine Horton. He was unmarried. His mother, Helen Maria (Barnes) Horton, the widow of wholesale dry goods merchant Henry Kenney Horton, lived with him. She died in October of 1877 and he moved to 9 Brimmer. By the 1878-1879 winter season, 146 Marlborough was the home of attorney Charles Pelham Greenough and his wife, Mary Dwight (Vose) Greenough. They previously had lived in Quincy. They continued to live at 146 Marlborough during the next season, but moved thereafter to the Longwood district of Brookline. During the 1880-1881 winter season, 146 Marlborough was the home of Dr. William Elbridge Boardman, a physician, and his wife, Mary Bangs (Bryant) Boardman. They previously had lived at 132 Chandler. By the 1881-1882 season, they had moved to 233 Marlborough. By the 1881-1882 winter season, 146 Marlborough was the home of lumber dealer Jeremiah Otis Wetherbee and his wife, Martha (Lovejoy) Wetherbee. They previously had lived at 19 Temple. They continued to live at 146 Marlborough during the 1890-1891 season, but moved thereafter to 194 Marlborough. By the 1891-1892 winter season, 146 Marlborough was the home of Dr. Samuel Gilbert Webber and his wife, Nancy Pope (Sturtevant) Webber. They previously had lived in Jamaica Plain. Samuel Webber was a physician specializing in nervous conditions, a professor of neurology at Tufts, and the former superintendent of the Adams Nervine Asylum in Jamaica Plain. He also maintained his medical offices at 146 Marlborough. They continued to live at 146 Marlborough during the 1895-1896 winter season, but moved thereafter to West Newton. Mary Eliza Guild continued to own 146 Marlborough. From the early 1890s, she and Chester Guild had lived in an apartment at the Hotel Guildford at 220 Clarendon. He died in April of 1895 and she continued to live there until about 1905, when she moved to the Hotel Vendôme. She continued to lease 146 Marlborough to others..
By the 1896-1897 winter season, 146 Marlborough was the home and medical office of Dr. Marshall H. Bailey, a physician and later the first medical advisor to Harvard. He previously had lived and maintained his offices at 757 Tremont. Dr. Webber continued to maintain his medical offices at 146 Marlborough with Dr. Bailey. Dr. Bailey continued to live and maintain his offices at 146 Marlborough until about1898 when he moved to Cambridge. By the 1898-1899 winter season, 146 Marlborough was the home of S. Antoinette (Nettie) (Walker) Laine, the wife of Oliver Whitcomb Laine. They previously had lived at 23 St. James. Nettie Laine appears to have been living alone and to have operated 146 Marlborough as a lodging house. By the 1900-1901 winter season, 146 Marlborough was the home of Nellie J. (Mackin) Bray, the widow of William Edward Bray, who also probably operated it as a lodging house. She previously had lived at 478 Columbus. She continued to live at 146 Marlborough during the 1902-1903 season. By the 1903-1904 winter season, 146 Marlborough was the home of Miss Amelia Hannah Ware, who operated it as a lodging house. In 1900, she had lived in Marblehead where she operated a hotel. She continued to live at 146 Marlborough in 1905, but moved thereafter. By the 1905-1906 winter season, 146 Marlborough was the home of Mary Emma (Monroe) Thayer, the widow of architect and mining equipment manufacturer George Burder Thayer. Her step-children, Blanche Etheridge Thayer, a teacher, and Albert Rufus Thayer, a portrait artist, lived with her. They continued to live there during the 1906-1907 season, after which they moved to the Hotel Oxford (southeast corner of Exeter and Huntington). In June of 1910, the New York Times reported that Mary Emma Thayer and her stepson, Albert, had taken out a marriage license; it is not known whether the marriage took place. By the 1907-1908 winter season, 146 Marlborough was the home of architect Walter Thacher Winslow, a widower. He previously had lived at 87 Marlborough. He continued to live at 146 Marlborough until his death in January of 1909. By the 1909-1910 winter season, 146 Marlborough was the home of clothing and woolens merchant James Leonard Wesson, a widower. He previously had lived at 174 Newbury, where he and his late wife, Caroline (Stevens) Wesson had lived since the 1880s. Living with him at 146 Marlborough were their daughters, Isabel Wesson and Caroline Stevens (Wesson) Freeman, the widow of Henry Huggeford Freeman, and his grandchildren, Lucy Freeman and James W. Freeman. 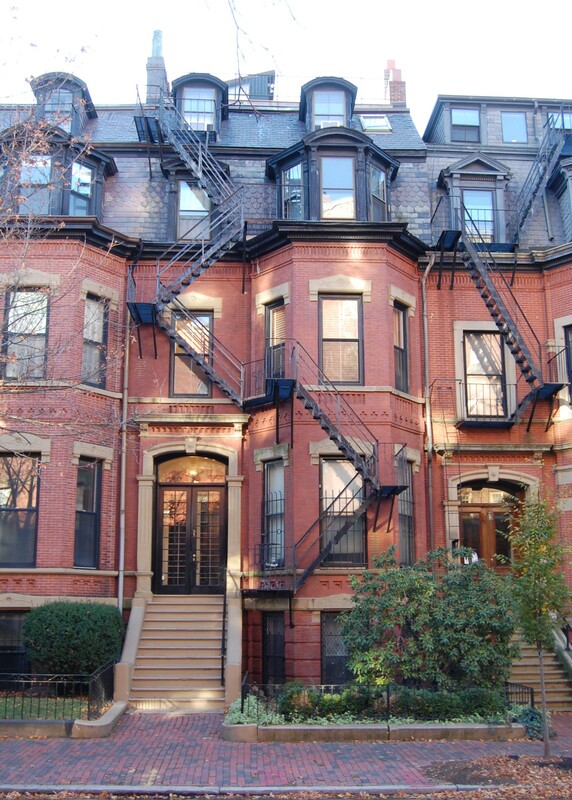 They continued to live at 146 Marlborough during the 1910-1911 winter season, had moved back to 174 Newbury thereafter. By the 1911-1912 winter season, 146 Marlborough was the home of banker Chester W. Bliss and his wife, Isadora (Leach) Bliss. They previously had lived at the Hotel Agassiz at 191 Commonwealth. They continued to live at 146 Marlborough during the 1913-1914 season, but moved thereafter to a new home they had built at 490 Commonwealth. 146 Marlborough was not listed in the 1915 Blue Book. By the 1915-1916 winter season, it was the home of Mrs. Cora (Codman) Ely, the former wife of William Ely, and their daughters, Corina Codman Ely and Anna (Nancy) Allen Ely. They previously had lived in Chestnut Hill. Corina Ely married in October of 1918 to Hall Nichols; after their marriage, they lived in Brookline. 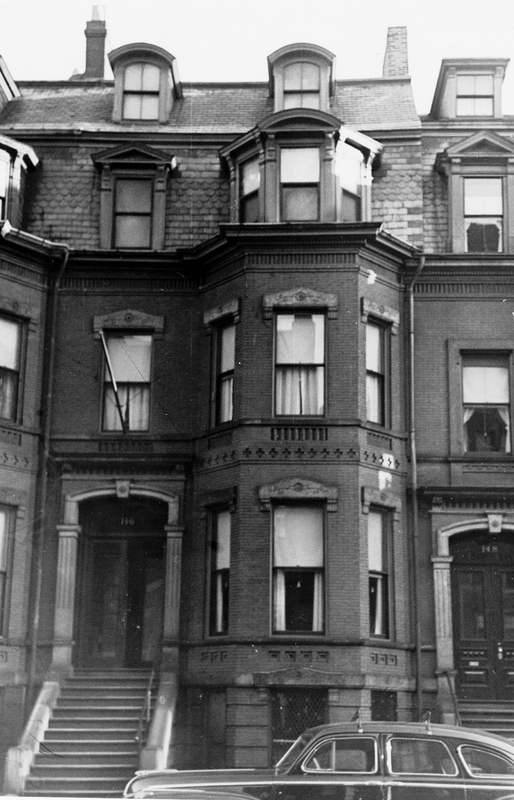 Cora and Nancy Ely continued to live at 146 Marlborough during the 1918-1919 season, but moved soon thereafter to 40 Fairfield. By the 1919-1920 winter season, 146 Marlborough was the home of Waldo Shaw Kendall and his wife, Edith (Parker) Kendall. They also maintained a home in Annisquam until about 1929. Waldo Kendall was an investment banker and, in later years, treasurer of the Massachusetts Association for Mental Health. Mary Eliza Guild died in March of 1923. At the time of her death, she was living in Watertown. On September 5, 1923, 146 Marlborough was purchased from her estate by Ethel Kendall. Waldo and Ethel Kendall continued to live at 146 Marlborough. On March 29, 1954, she transferred the property to her husband as trustee on her behalf. Waldo Kendall died in December of 1957, and on March 7, 1958, 146 Marlborough was acquired from the Ethel P. Kendall Trust by real estate dealers Stuart H. Hastings and Joseph Gautreau. In April of 1958, they applied for (and subsequently received) permission to convert the property into ten apartments. The property changed hands and on May 31, 1979 was acquired by the Pride Realty Corporation (Robert N. Lerman, president; Neal S. Gold, treasurer). On August 14, 1979, Pride Realty converted the property into ten condominium units, the 146 Marlborough Street Condominium.